So the comic I was working on for today is taking longer than I thought it would. 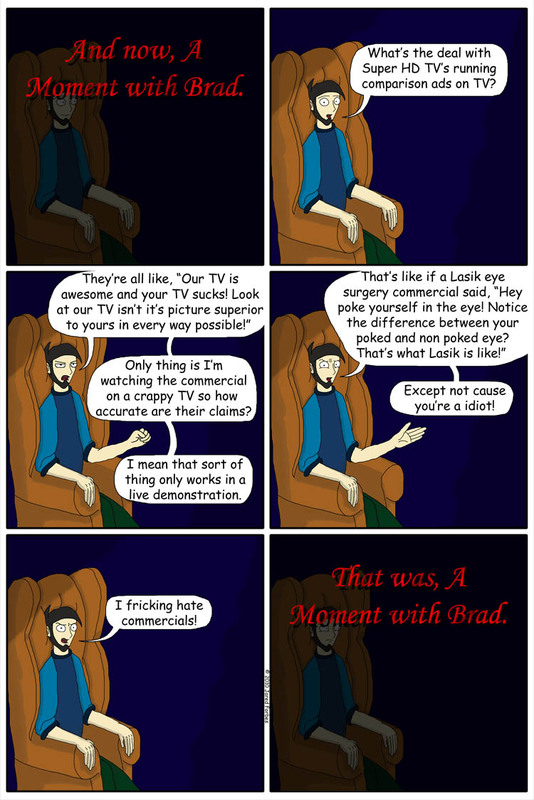 So here's a Moment With Brad. I got the idea for this the other day when I was watching a video on the internet. Well actually, I got the idea from the stupid unskippable commercial they're sticking in front of internet videos these days, but I digress. The commercial was for Dolby Digital surround sound systems. They played a clip from Iron Man with garbled muted sound, than they "turned on" The Dolby Digital and the sound became instantly better. It was really convincing. Only thing is, I don't have Dolby Digital surround sound, I don't have any sort of surround sound. I'm watching this commercial on my laptop using my cheap $20 headphones that I accidentally sat on and now half the time the right earphone doesn't work. My point is, companies do this kind of comparison advertising all the time, but the problem is comparable advertising like that only works as part of a live demonstration. I can't really tell how awesome a sound system is unless I'm physically listening to something playing on that sound system; I can't tell how sharp a new television's picture is unless I'm watching something On that television. However, there is one commercial I can think of that realizes the error in advertising like that. The Sharp Quattron. A new television that uses yellow pixels along with red, green and blue pixels to make up its picture, giving it a much more vibrant color, and the best thing about these commercials is they realize practically everyone watching the commercial is watching it on a standard RGB color screen.